Information about Small Business Administration (SBA) Federal Disaster Loan for Affected Families and Businesses. SBA provides low-interest disaster loans to homeowners, renters, businesses of all sizes, and most private nonprofit organizations. SBA disaster loans can be used to repair or replace the following items damaged or destroyed in a declared disaster: real estate, personal property, machinery and equipment, and inventory and business assets. The City of Revere has established a fund so that these residents and business owners are not alone in shouldering the burden of rebuilding their lives and our community. Please support the relief fund here and share this information. 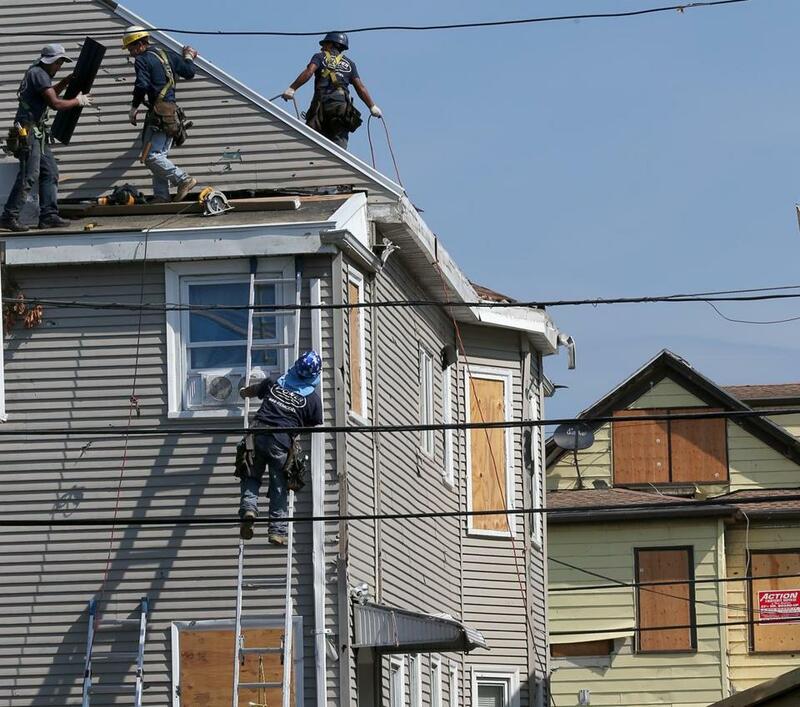 Repairs were underway on Wednesday to a house on Taft Street in Revere, but other residents were still negotiating with insurance companies following last month’s tornado. REVERE — Exactly a month ago, Paul Carrabes was at work in East Boston when he got a call telling him a tornado had roiled this oceanside city. “My brother called and said, ‘You need to get home. The house is gone,’ ” Carrabes, 61, recalled. Just after 9:30 a.m. July 28, an EF-2 category tornado, which can generate winds of up to 120 miles per hour, slammed directly into Carrabes’s house on Revere Beach Parkway, ripping off the roof. Carrabes and his brother will not be returning anytime soon to the home where they grew up and later lived with their spouses. “We’re getting an apartment,” said Carrabes, who plans to move Sept. 1 to Charlestown, where he and his wife have a one-year lease. “The insurance company hasn’t settled anything on the house as of yet. It is a story that rings with sad familiarity on the Revere streets that bore the full fury of the tornado, which roared along a 2-mile path that extended from Revere Beach Parkway to Brown Circle. Within four minutes, the storm was over, with no deaths or serious injuries. For those with homes or businesses damaged by the tornado, the last four weeks have brought a flurry of calls with insurance companies, stacks of repair estimates, and lots of waiting. “When you go to bed at night, you don’t sleep good because your mind is going with all these things that you have to do,” said James DePaulo, a 70-year-old retired air traffic controller. DePaulo said he had to leave his Revere Beach Parkway home for three days after the tornado caused about $100,000 in damage to his front porch, slate roof, and walls. “The biggest problem is trying to deal with the insurance company in terms of what they’re going to pay you and trying to get a contractor who can do it all,” DePaulo said. Immediately after the storm, 14 buildings were left uninhabitable and nearly 70 structures were damaged, said Miles Lang-Kennedy, chief of staff to Mayor Daniel Rizzo. 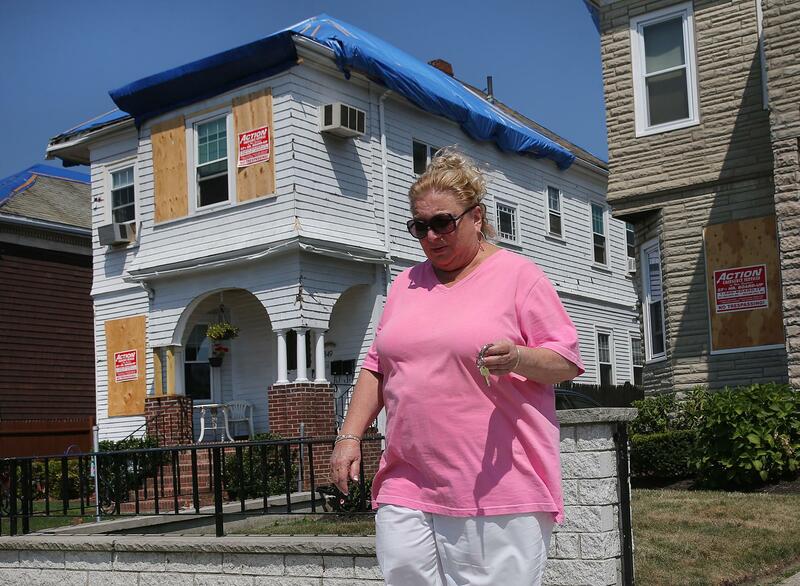 Carolann Gambale walked past neighbors’ homes still patched with blue tarps and plywood on Wednesday on Revere Beach Parkway. Since then, the number of uninhabitable buildings has dropped to nine, Lang-Kennedy said. So far, more than 1,300 tornado-related insurance claims have been filed, including requests for help paying for tree and debris damage, according to the state Division of Insurance. The agency said the average claims seek payment for $10,693 in losses. The total amount of damage to public property is unknown, but Rizzo said tree removal alone cost more than $400,000, and there is damage to eight municipal buildings, including City Hall, which might need a new roof, at a cost of about $1 million. Still, the extent of destruction was not enough to qualify for federal disaster aid, leading city officials to look elsewhere for help. One source is the Revere Tornado Relief Fund, which has raised about $225,000 so far, Rizzo said. The deadline to apply for aid is Sept. 15, and money is expected to start being distributed in late October, Lang-Kennedy said. About 40 applications for assistance have been received. “It’s really been rewarding to me to see the outpouring of support and to see, really, the generosity that is making this bad situation at least a little bit better for these victims,” Rizzo said in his office. The US Small Business Administration is offering low-interest disaster loans to residents and businesses, but there has not been much interest, an agency spokeswoman said. The office has received four applications for home loans and one for a business loan, spokeswoman Kathy Cook said. Three home loan applications have been approved for a total of $66,000, she said. Cook encouraged people to consider applying for aid. Rizzo said he has heard a wide range of reports addressing how insurance companies have handled claims. They range from stories of firms offering blank checks to reports that consumers are getting low-balled. Anthony Pintone, co-owner of Master Auto, said he has been caught in a waiting game since the tornado ripped the roof off his building. He said he rented space in Saugus where he can do vehicle repair work, but the rest of his business is on hold.